Heads up! We have a coupon code to share. As with any regulated device containing a rather sophisticated electronics package as this one does, I make a point of using the device day in and day out for a minimum of 30 days before publishing a review just to make sure that the device will function as advertised and see if it would be a good long-term investment. I have been using this device from the start of my day until lights out for close to 60 days now and I have to tell you that if functions as promised and it has become a favorite APV of mine. If you are not familiar with this device, it is a 50 watt regulated digital switch DC-DC converter controlled APV with an added temperature control function. Display: 0.69″ Diagonal OLED screen. Output Power: 1 Watt through 50 Watts in 0.1 Watt Increments. Coil Resistance Range: Normal Mode 0.16 to 2.0 Ohms. Temp Controlled Mode 0.1 Ohm to 1.0 Ohm. Connection: 510 threaded connector with adjustable top cap to adjust to different atomizers without gap. Battery: 1 X 18650 with a continuous discharge rating of 20 amps or more. And by the way, the Invader Mini is available in Blue, Gray or Black. Heaven Gifts sent me the Blue model. And fortunately for me, it is not that really bright blue as shown in the pictures. Blue yes, just a bit subdued and not bordering on neon. Now that I have all the specifications and the healthy list of features (all of which work flawlessly) out of the way, on to my experience using the device. The device arrived in 3 days Via DHL in a well padded shipping box and the device itself is nicely packaged in a hard plastic clamshell case which also contains a very easy to understand instruction manual. My first impression when I removed the device from its packaging was “Damn, this sucker is heavy”. Which is as it should be as this device is made to be waterproof (or very nearly so) and virtually indestructible. Not that I have tried it myself but there are videos available that show people running over this device with automobiles and it emerges unscathed. Myself, I tend to treat the devices I use with great care. Waste Not Want Not. The entire device except for the OLED screen, the battery cover and the adjustable 510 connector cap is covered in a thick silicon skin which has a lot of texture molded into it to make it easy to grip. And once you have become accustomed to the weight of the device, approximately 220 grams or 7.76 ounces without the battery, this device is actually very comfortable to hold and conforms well to my hand. The heavy-duty and well sealed battery compartment cover screws in flush with the base of the device making it very stable to stand upright on a desk or table with little risk of it falling over even with a good-sized tank attached (22mm diameter) due to the fit and the weight of the device. I have found it to be at least as stable as a dual 18650 box mod. The battery cap can be a bit stiff the first few times you need to unscrew it to install your battery but it has a “Knurled” outer surface so you can get a grip. The same can be said of the adjustable 510 top connection as well. On the subject of the 510 connector, it is well machined and quite smooth. The buttons have a nice feel to them even as protected as they are by the heavy silicone outer sheath and can easily be felt by touch alone. The OLED screen is bright enough to be seen in most lighting conditions and is easy to read. 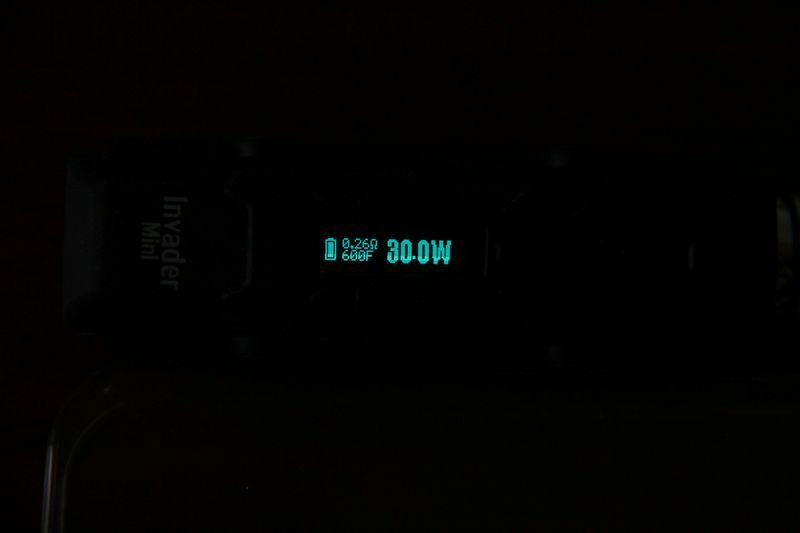 The Invader Mini also has a built-in power saving program. The OLED display shuts down after 30 seconds. If you set it aside without an atomizer on it, the device will shut off after about 2 minutes of non use. If it has an atomizers attached, it will shut off after about 50 minutes. Click the power button 5 times to turn back on. 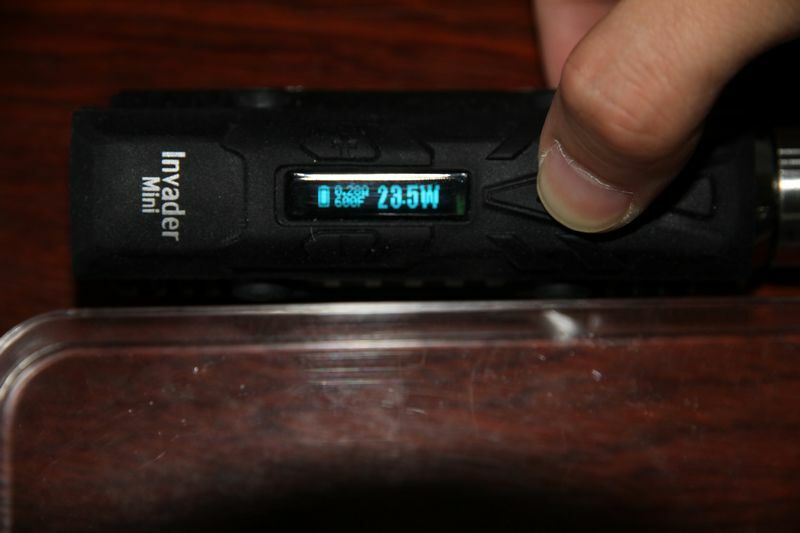 The Invader Mini also constantly monitors the resistance of your coil and not just when the power button is pressed. For example, if you remove your atomizer to top it off with E-Liquid or you remove your tank to install a new coil, the device recognizes that this has happened and when you screw it back into the connector, the device will ask you if you are using a new coil or the same one and prompt you to press the + button for a new coil or the – button for the same one. In the “Normal” mode, with a Kanthal wire build, it operates as a variable wattage device should. Easy to adjust up or down in 0.1 ohm increments and if you hold the buttons down they will rapidly scroll through the wattage range but not so fast that your eyes can’t follow the progress. Also, if the device powers down after 50 minutes of non use, it will remember your settings when it is turned back on. The same is true if you replace the battery. 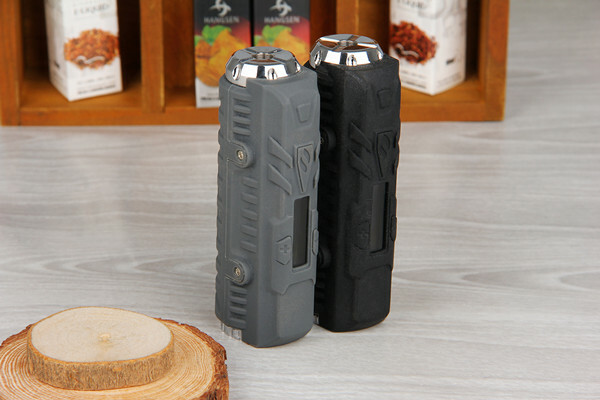 If you wish to use it in the Temperature Controlled mode, all you need to do is to install an atomizer with a NI200 coil inside, press the power button and within seconds, it will detect the NI200 coil and auto set to TC mode. The same is true when using a Kanthal coil. To adjust the Temperature, you simply lock the device and then press the +/- buttons until you reach the desired temp between 200F to 600F. All of this is covered in nice detail in the well written instruction manual. Now back to the build quality for a second. As I have said, this thing is built TOUGH! I have no doubt that it will handle some major abuse that will destroy whatever topper you have connected to it. But in the event that you have an accident where the Invader Mini gets dropped and it lands tank first and it jams or breaks off its 510 connector into the adjustable cap of the Invader and can’t be removed, you can purchase a new top cap for less than $10. While the description does say it is waterproof, I would not tempt fate by sticking it in the pocket of my swim trunks while enjoying a day swimming at the beach. And if you drop it into the lake while fishing, it is going to sink like a rock which is tied to another rock. 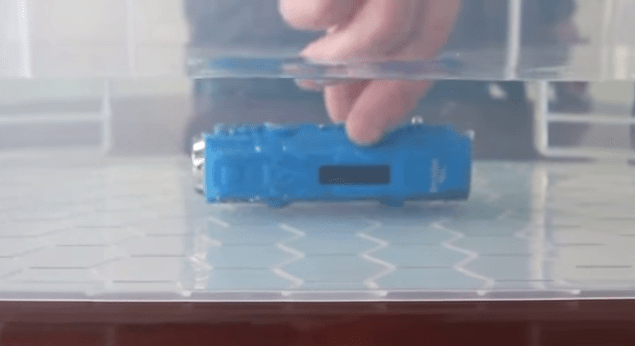 But what vaper among us has not had a tank leak E-Liquid all over the device that is powering it and making quite a mess and possibly having some of the liquid make it into the electronics inside the device? And even ruining it for good? With the Invader Mini, it’s not an issue at all. On more occasions that I want to admit to, I have gotten liquid on it and I just hold it under some running tap water for a moment and then dry with a paper towel. No muss, no fuss. Water does not even make it into the vent holes. What vent holes? It does not have any! Design team flaw? Nope, not at all. They got that covered too. In the event that a battery should vent while it is installed in this device, it is designed so the hot gasses will breach the silicon skin surrounding the OLED display and buttons. Final thoughts on the Heatvape Invader Mini? This is indeed an APV made to withstand most of what life can throw at it and its owners. Take it to work, take it camping and fishing and not worry about breaking it. Works very well in both normal and temp control mode, all of the bells and whistles and protective functions perform as they should and like I said, once you get used to the heft of the device, it really feels good in your hand. And this is one of the very few devices that I own that if I should ever lose it (cause I damn well can’t break it) I will purchase a replacement for it. And if you have read this and you have decided that this is worthy of becoming your daily driver or an addition to your collection, you can find it here for $65 and a 6 month guarantee.